DSSSB Vacancies using the official website http://dsssbonline.nic.in. Opening date of DSSSB application forms is 01-11-2017 and closing date to submit filled application forms is 21-11-2017. Only female candidates are eligible to apply for these Prison Matron Jobs. Age limit for these vacancies is 18 years to 27 years as on 21-11-2017. The mode of selection for the recruitment of candidates for DSSSB Prison Matron Jobs is based on One Tier Examination and Skill test (If applicable). Full details of Tier I examination scheme/ pattern are mentioned in the DSSSB Notification. No application fee for female candidates. 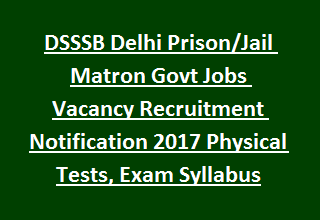 Full details of Delhi Subordinate Services Selection Board DSSSB Prison Matron Jobs Recruitment vacancy details, Educational qualifications, age limits, relaxations, selection process are mentioned below. Total Matron Vacancies available in Delhi Subordinate Services Selection Board DSSSB Recruitment are 64 posts. Post Name: Matron (Prison Department): 64 posts. Age limit is 18 years to 27 years. Relaxations will be admissible as per DSSSB govt rules. Candidate must have passed 10+2 (Senior Secondary) from recognized Board. -Race: 800 mtrs in 4 minutes. Selection will be made on the basis of One Tier Examination and skill test wherever applicable. One Tier exam consists of total 200 MCQ type questions. Total marks are 200 and the time duration is 2 hrs. Negative marking for each wrong answer is 0.25 marks. Candidates must have to apply online through the DSSSB official website http://dsssbonline.nic.in. Opening date for submission of online applications is 01-11-2017 and closing date is up to 5 P.M. on 21-11-2017. The link will be disabled after the last date.